﻿We need $600 for a 10-week old baby kitten named cheese she has a respiratory infection and also needs enucleation surgery for her right eye. Her eye has ruptured. We have made an appointment Wednesday 10/10 for her at the nickel city animal hospital for this surgery in hopes we raise this money for her to be seen. Any Donation Is Very Appreciated For Cheese. We are raising $600 for a kitten we plan to adopt and needs surgery. Cheese is 10 weeks old. She is the sweetest kitten ever. We plan to get the treatment done and adopt her after. We are raising $600 for a kitten we plan to adopt and needs surgery. Cheese was found she is 10 weeks old she needs enucleation surgery in her right eye, it has ruptured and is only getting worse she is the sweetest kitten ever. We plan to get the treatment done and adopt her after. 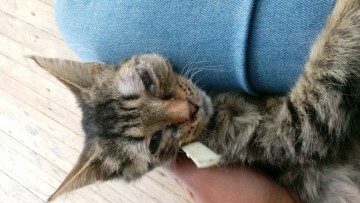 Please help raise money for Cheese to have Enucleation Surgery her right eye has ruptured. Any donation is greatly appreciated. We are raising $600 for a kitten we plan to adopt and needs surgery. Cheese was found she is 10 weeks old she needs enucleation surgery in her right eye, it has ruptured and is only getting worse she is the sweetest kitten ever. We plan to get the treatment done and adopt her after.